When the German war machine rolled over the Netherlands in May 1940, Titia Wetselaar Bozuwa was an eight-year-old girl living in the southern city of Breda. She wrote about her family’s endurance of that five-year Occupation in her memoir, In the Shadow of the Cathedral. 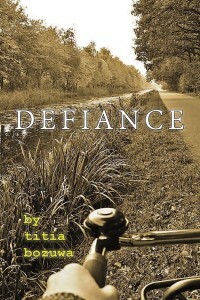 In Defiance, her first work of fiction, she pays tribute to the many who defied the German Occupation. Challenging the expectations of Dutch society, Anna Smits enrolls as a medical student at Utrecht University. But in a country occupied by Nazi Germany, student life is not what Anna expected. Social clubs are closed; Jews are forbidden from attending schools; and in 1943, students are ordered to sign a declaration of loyalty to the occupying German government. Anna and her seven closest friends—the Group of Eight—refuse to sign. Inspired by a sermon about the Good Samaritan—a sermon that got the minister thrown into prison—the Group of Eight vows to help the victims of Hitler’s brutal regime. They hide Jews and provide them with fake IDs; they keep desperately needed medicines out of the hands of the Nazis; they raise funds for orphaned Jewish children. But as the war drags on and the Nazis’ hold tightens, the Group of Eight shrinks. The few that remain defiantly resist the ever-onerous Occupying force. But how can they fight the lawlessness with which the Germans shoot first and don’t bother with questions? How can they fight the devastating Hunger Winter of 1945? Anna clings to her beliefs and mission, aided by her remarkable grandmother, Baroness van Haersolte, as the country waits for liberation. But will they all survive that long?